The Floodstopper single zone package is perfectly suited to most residential and basic commercial applications. 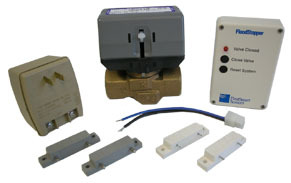 This package comes complete with everything you need to keep your home safe from a major water leak, including the FloodStopper single-zone controller, the actuator and shut-off valve assembly, the 24 volt power supply transformer (plugs into standard electrical outlet! ), and 4 sensors - two top terminal (gray) and two rear terminal (white). Additional sensors or wireless accessories can be purchased separately (the single-zone controller can support up to 250 sensors). Also see our special wireless Extra Value Packages for even greater savings!